The Designer here has done a great job thinking about the end client. No longer do we need to rely on disposable knives when we take our fresh bagel away from Starbucks, it’s included! However, this is not a practical design for the product’s life cycle which is just as important – something a lot of designers in the age of edgy / facebook trending have forgotten. Space Saver? 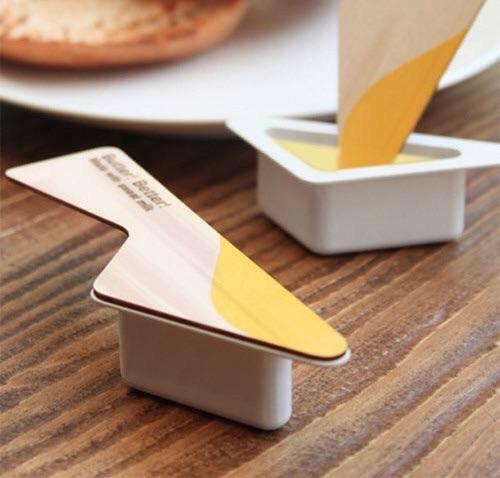 No thanks – this design requires the space of nearly 2 of what we consider a normal butter pot – increased number of shipments to customers, increased number of deliveries on the road – not very ecological is it? These never end up in the recycling bin, they get thrown into the standard waste at your local Starbucks etc – just contributing to more waste globally. True it’s wood – but not the good kind, this will be bleached with chemicals to ensure it meets FDA standards, and well – that’s not going to be good for the ground either. When re-inventing the lid – it can be much more simple. Perhaps a designer could consider a making the lid of a slightly firmer plastic, which could be folded into a blade like shape for spreading – whilst maintaining the same small profile. There are things to be said for improving the current systems, and I can understand why it’s been done here – I just think the designer has missed the mark on that one.